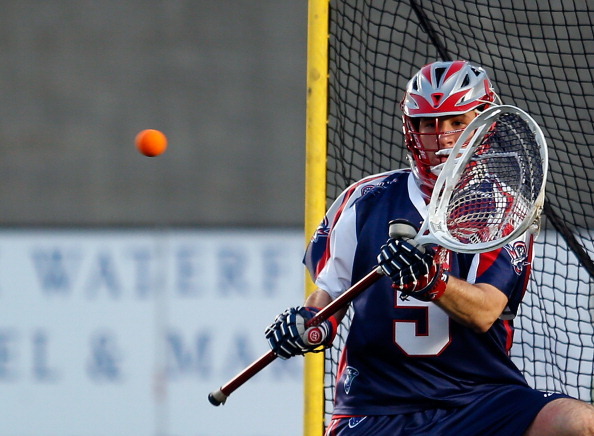 The Boston Cannons opened their 2015 campaign with a win over the Denver Outlaws 15-13. The scoring started out on the Cannons side with the first goal of the season from Rob Emery, the sophomore player out of Virginia. Chris Bocklet tied things up on the Outlaws side just one minute later. By the half it was 8-5 Cannons with much of the offense coming from Boston. Denver’s offense seemed stifled without having the majority of their NLL players with them, which included John Grant Jr and Jeremy Noble. Goaltender Jesse Schwartzman seemed frustrated over time with the Cannons able to get around the net seemingly at will. The Outlaws came out of the half fired up but the Cannons scored back to back two point goals from Ray Emery and Josh Amidon. It was Amidon’s first goal with the Cannons. Denver scored twice right away to get back into the game down 12-8 with goals from Eric Law and Justin Pennington. However, Marty Bowes took the Cannons momentum back with a beautiful goal from his back in front of the crease. Without their big name stars, Boston’s scoring came from who used to be role players. The newest captain, Will Manny, of course had his goals, and Emery appears to have taken that step to become one of the offensive leaders on this team. Newcomer David Emala also stood out with two goals. In the previous seasons Emala had just three games played in his career with Charlotte, but with a new look Boston offense, he seems to fit in well. With Chris Eck not playing this season, Craig Bunker has taken over as the starting faceoff man and he looked solid in the first game of the season going against veteran Anthony Kelly. There were some question marks about the Cannons defense thanks to the losses of Kyle Sweeney and Jack Reid, but the D unit looked strong in this game. Scott Ratliff especially stood out now in his third MLL season. He will need to be one of their leaders on defense this season, especially until Brodie Merrill returns from playing in Toronto. Ratliff shut down Jeremy Sieverts, who was one of the only true scorers dressing with the Outlaws. Justin Pennington stood up for the Outlaws in this game with four points.